Rarely (and reportedly it is also good luck) a baby is born "in the caul" or in the amniotic sac. This is usually just a piece of the sack over the face or something (the rest of it delivers with the placenta) but it is kind of a neat thing. 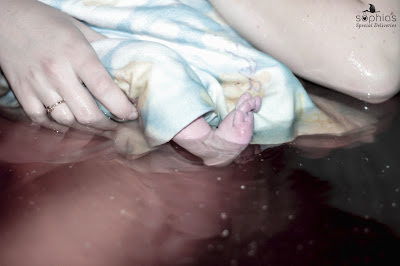 These pictures show an "in the caul" birth if you look closely. All photos from Sophia's Special Deliveries, Sonoma County doula and photography services. Amazing! My baby girl (now 2 months old) was also born in the caul. It was my midwife's first caul birth, and I remember her telling me "she looked like she had on an astronaut's helmet when she came out!" :) I wish someone had been able to get a picture. One of my boys was born in the caul. The nurses were pretty stoked about it.